Natterer's bat has a wingspan of 245 - 300 mm and long ears with a distinct backward curve. Its fur is long, soft and brown-grey on the dorsum but white on the underside. Similarly to M. daubentonii, it also has a distinct demarcation along the neck. This species occurs in various habitats, but is predominantly found in forests (e.g beech and oak) and close to water bodies. During summer it roosts in hollow trees, hollow bricks in buildings and bat boxes. In winter, M. nattereri can be found hibernating in rock crevices, caves, cellars and other underground sites. Not only is Natterer's bat able to fly slowly but also to hover close to the ground and vegetation. With the latter and gleaning techniques, it is able to capture its prey: spiders, harvestmen, flies, beetles and aquatic insects. Generally considered a sedentary species; however, some individuals are know to have covered long distances (e.g. 266 km). 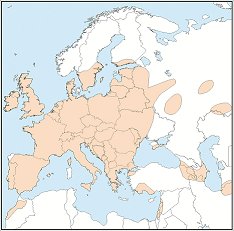 Natterer's bat can be found in north-west Africa (coastal Morocco and Algeria), and throughout Europe. The species also occurs in the Caucasus region and other parts of Asia Minor. 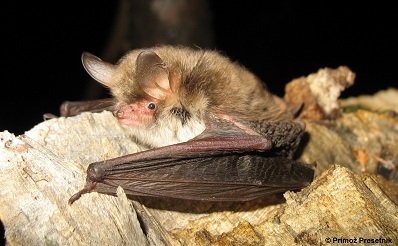 Threats to Natterer's bat include the loss of woodland and roost sites in trees, buildings and underground habitats. It is also collected for traditional medicinal purposes in North Africa.